No, I didn't spell dex, as in the telephone directory, incorrectly. DEXA is Dual-Energy X-ray Absorptiometry, and I'm not even going to try to pronounce that last word! And yes, it's spelled correctly! A DEXA is a non-invasive exam which "estimates the amount of bone mineral content in specific areas of your body. It measures the amount of X-rays that are absorbe d by the bones." Two X-ray beams (dual energy!) pass through the body and are measured by a detector in the scanner arm, usually taking about 20 minutes. Basically, it's checking for osteopenia and osteoporosis. Osteopenia is a condition of lower than what is considered 'normal' bone density, and is the precursor to osteoporosis, which is the disease of bones whereby fractures are more likely to occur. We all know older women who have fallen and shattered some bone or other - some men experience it too - and that's from the fragility factor, mostly caused by osteoporosis. DEXA is now more commonly referred to as DXA (wonder why the hand-out the lab provides doesn't know that?? ), and is not to be confused with a nuclear medicine bone-scan which includes a radionuclide injection. That bone-scan is sensitive to certain metabolic diseases of bones in which bones are attempting to heal from infections, fractures, or tumors. Lucky me, I just experienced a DXA. Why did I have to undergo yet another test? Well it seems that the wonderful poisons I'm now taking to complete the current breast cancer treatment are renowned for contributing to osteoporosis, among other things. This exam will be compared to an exam taken a couple years back when I broke my left hip in a fall. The fall was an accident, unrelated to osteoporosis, but after I had healed up from the surgery, the doc wanted to see how my bones looked. I had some signs of osteopenia in several joints and minor osteoporosis beginning in the other hip, which 'they' said was not unusual, considering all the traumatic degenerative arthritis I have from previous injuries. The cancer doc wants to put me on Reclast, the once a year 15-minute injection of zoledronic acid (Reclast) to treat against the potential of further osteoporosis damage. There are daily, weekly and monthly treatments (pills) available also, but I'm already taking so damned many pills, we both believe the injection would be the way to go. If the insurance company will go along with it! If my exams show any reduction of bone density, then, because of the cancer treatments I'm undergoing, my doctor believes they will agree to it. Like every other drug out there, this one has a list of side effects that would scare the pants off you, if you let them. One major problem suggests not prescribing the medication if a cancer patient (me!) has had radiation treatments (not me!! ), because it can cause major jaw bone problems during any dental procedure. At least that one isn't a worry. What else is happening? There is some good news for a change!! My taste buds are starting to return! I realized the other day that my morning tea was super sweet. I have been putting extra sugar in the tea to make it palatable (it was incredibly bitter) during the chemo procedures, and now I don't need to anymore!!! Other things are tasting better every day! I can't tell you how pleased I am to be able to taste again! Food is my favorite hobby, and to be able to enjoy it again is heavenly!! A bit gross, and I apologize for mentioning it, but I had my first firm bowel movement yesterday for the first time in over 4 months! Having the 'runs' constantly gets really old! Now, hopefully, my poor fanny can start to recover and heal!! I surely do hope that I never need chemo again, because this particular very rude side effect was probably the worst of all!! Since the Neulasta shots - the 'shot from hell' - are finished, I'm no longer suffering the debilitating aches and pains in all my muscles and bones! It did it's job, because my immune system stayed strong and I suffered no maladies, no infections, but it sure made life miserable! The lymphedema therapy is a continuing process. I have three areas in my arm that are particularly congested - full of lymph fluid - and very hard to touch. The girls work on those three areas of fibrosis every visit with different techniques to try to break them down so they will drain. One technique involves a Schneider pack, placed under the compression wrap, to help break up the fibrosis. They go by several nicknames, the most popular at my clinic being 'taco' (sort of looks like a cheap taco). Varying sizes, densities, and shapes of foam are formed into little packets, creating both high and low pressure points . . . "increasing venous re-absorption while leaving tissue spaces for the rerouting of excess interstitial fluid to functional lymphatic pathways. The foam chips not only kept the trapped proteins from coalescing, but with each body movement, or muscle contraction, they provided a mini-massage . . . gently working their way down into the tissue." In other words, they create little dimples in the skin and tissue, making it easier for fluids to move around and escape. The 'taco' is making significant progress in the two areas on my forearm, but the one on the underside of my upper arm is not cooperating. For this site, yesterday we tried something different. Kinesio tape. You may have noticed some of the athletes in the 2008 Olympics using various colors of tape on parts of their bodies. It is used to give support and stability to muscles and joints. Also, important for me, it can help with the circulation of fluids, lymph fluids! The tape is applied under the compression wrap. It has dozens of tiny channels on the sticky side of the tape, so under compression, it 'suggests' a direction of flow to whatever might be hiding just under the skin. (my words - could you guess that?) I'm leaving it in place until I see the therapists tomorrow and we'll cross our fingers that it helps! If you followed the link on fibrosis, it can cause some really serious problems, and I have enough problems without adding more!! I'm actually becoming accustomed to walking around with this outrageous compression bandage on my arm everyday. But so many people ask "what happened to you", "what's wrong". When I try a simple explanation, I can see they are really sorry they asked, although I have met a couple folks who've seen it before and just offer sympathy and a get better hug! I've started carrying a small fan when I walk Misha - the summer days and the heavy rains have brought out the bugs! And the nasty little no-see-ums bite me! They especially seem to like my ears and right around the base of my silly ball cap. I get BIG welts from their bites. Had to laugh at myself the other day - I almost knocked myself out, swinging my club of an arm at a bug buzzing in my ear! That's when I started carrying the fan!! I just now received a photo of the tat my Silver Fox got this morning, honoring me and my battle with breast cancer. 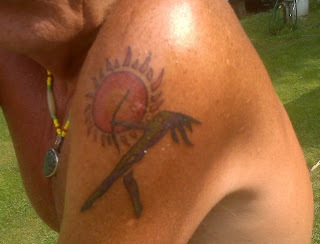 The warrior is the logo for the drug Herceptin that I'm receiving for balance of the year. An incredibly special honor that touches me to my soul!